Fort Loramie's Nick Brandewie dribbles during a nonconference game on Saturday in Maria Stein. 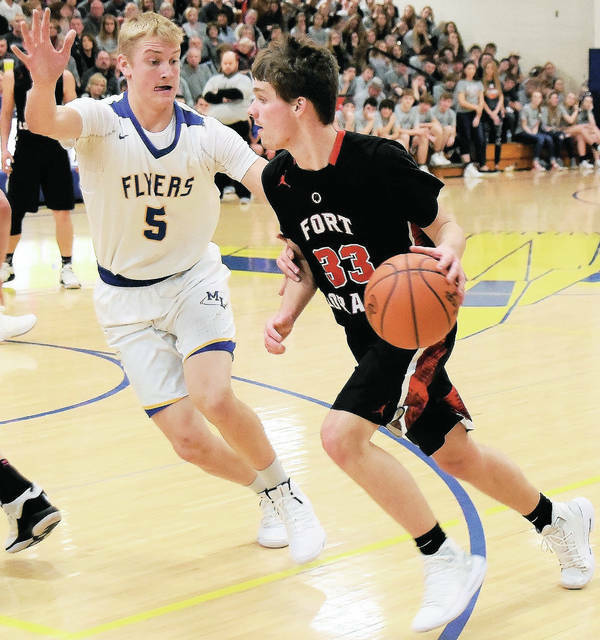 Fort Loramie's Nolan Berning dribbles during a nonconference game on Saturday in Maria Stein. 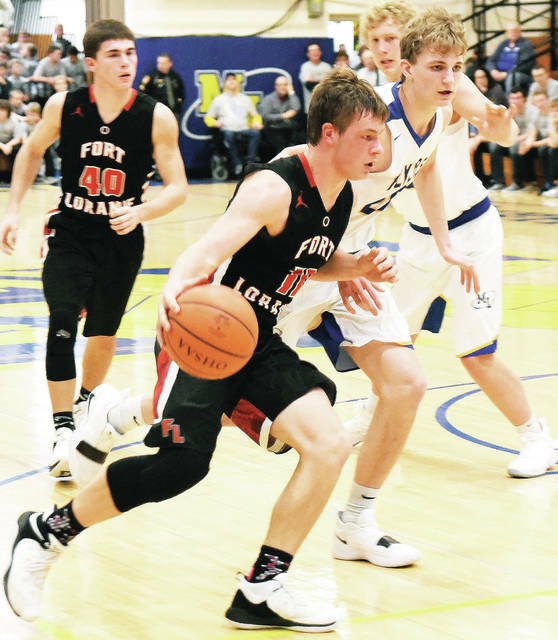 Fort Loramie's Eli Rosengarten drives to the basket with pressure from Marion Local's Nathan Bruns during a nonconference game on Saturday in Maria Stein. 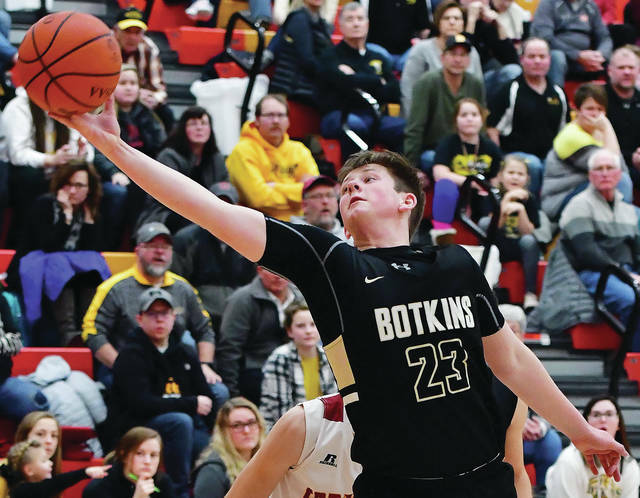 Botkins' Tyler Free gets a rebound during a nonconference game on Saturday in New Bremen. Botkins' Spencer Heuke and New Bremen's Benjamin Kuck go after a rebound during a nonconference game on Saturday in New Bremen. New Bremen's Benjamin Kuck and Botkins' Jayden Priddy-Powell go after a loose ball during a nonconference game on Saturday in New Bremen. 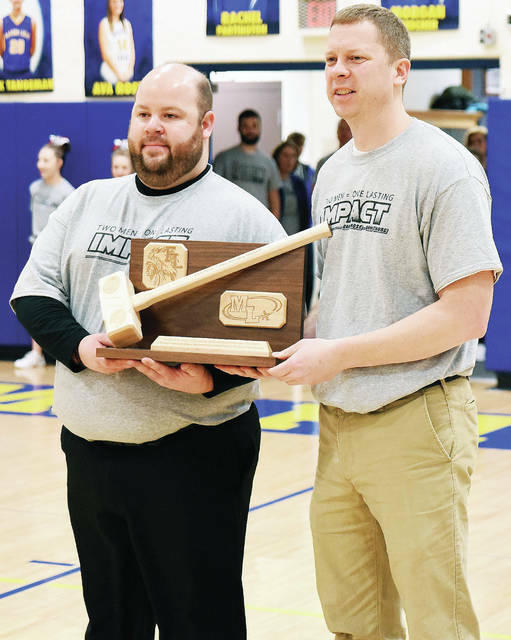 Fort Loramie coach Corey Britton, left, and Marion Local coach Kurt Goettemoeller display the Impact Trophy before a nonconference game on Thursday in Maria Stein. The new traveling trophy honors Aaron Rose and Dan Thobe, who were teachers and coaches that had ties to both schools and died last year. The trophy will be presented to the winner of the game each season. MARIA STEIN — Marion Local jumped out early and led the entire way to earn a 41-26 nonconference win over Fort Loramie on Saturday. The Flyers took an 11-5 lead by the end of the first quarter and led 18-7 at halftime. The Redskins made a push in the third quarter but didn’t pull closer than eight points. 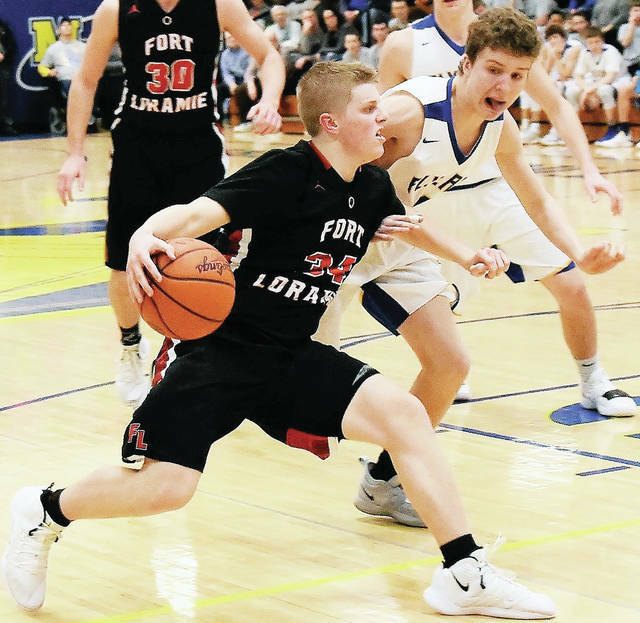 Eli Rosengarten led Fort Loramie with eight points. The game was the first that featured the Impact Trophy, which will be awarded to the winner of the matchup each season. The trophy was created in honor of former teachers and coaches Dan Thobe and Aaron Rose, who had ties to both schools. Both men died last year. The Raiders used a 16-4 scoring advantage in the fourth quarter to put away Ansonia in a home nonconference game on Saturday. The Raiders led 13-10, 24-19, 37-33 at the quarter breaks. Jordan York scored 25 points for Russia while Evan Monnier added eight. Riverside took a 14-9 lead by the end of the first quarter but Houston rallied and earned a nonconference win on Saturday in De Graff. The Wildcats outscored Riverside 14-13 in the second quarter to trim the halftime gap to 27-23 and then used a 24-7 scoring advantage in the third to take control of the game. Winner and Douglas each scored 16 points for Houston while Leist finished with a game-high 17, 10 of which came in the fourth quarter. Kameron Schlumbohm scored 15 points for Riverside and Kyle Knight added 15. The Pirates shot 15 for 46 (32.6 percent) from the field. Houston won the rebounding battle 32-22. Minster bounced back from a disappointing loss at Versailles on Friday with a nonconference win at home against Jackson Center on Saturday. The Wildcats took an 11-8 lead by the end of the first quarter and led 25-19 at halftime. The Tigers trimmed the deficit to 40-35 by the end of the third and outscored Minster 12-9 in the fourth. Jarod Schulze led Mister with 17 points while Jack Heitbrink scored 13 and Cody Frericks had eight points and six rebounds. Aidan Reichert led Jackson Center with 15 points and five rebounds. Trent Platfoot scored 12 points and Jerron Reese added 10. New Bremen overcame a halftime deficit and made a game of it, but Botkins held on to earn a nonconference win. Spencer Heuker scored 11 of his 13 points in the first half to help the Trojans take a 29-21 halftime lead. Nolan Bornhorst scored 11 of his game-high 16 points in the third quarter, though, to help New Bremen tie it 36-36 heading into the fourth. The Trojans earned the win with an 11-10 scoring advantage in the fourth. Zane Paul added 10 points for Botkins and Tyler Free and Jaydon Priddy-Powell finished with eight apiece. Mitchell Hays added eight points for New Bremen. The Jets used a 25-12 scoring advantage in the fourth quarter to rally and earn a nonconference win at home on Saturday. Skyler Piper scored 10 of his 12 points in the fourth quarter to help Fairlawn rally while Ashton Piper scored eight of his game-high 17. Jackson Jones added 15 for Fairlawn. Waynesfield-Goshen led 7-6, 23-17 and 40-35 at the quarter breaks. Sidney did everything possible to make it difficult for Piqua on Saturday in a home Greater Western Ohio Conference American North Division game. But Indians pulled away late to earn a 58-39 victory and complete a season sweep of the Yellow Jackets. Piqua won the first matchup of the two squads 57-14 on Dec. 12. The Indians got off to a good start as Tylah Yeomans was a one-girl nemesis for Sidney in the first quarter. She hit both her 3-point attempts, scored three points from the paint and had several steals as she scored 12 points to lead Piqua to a 17-7 lead. But the momentum swung quickly in the second quarter. The Yellow Jackets then ran off 10 straight points. Keliyah Marcus and Samantha Reynolds got easy layups as Sidney broke the Piqua press, and when Emma Wiford scored on a put-back, Piqua led just 23-21. The Indians made 4-of-20 field goal attempts in the second quarter and 3-of-17 in the third quarter. Yeomans led Piqua with 16 points and eight rebounds. Anderson scored 10 points, Andrea Marrs pulled down nine rebounds, Johns scored eight points and Bachman and Izzy Kidwell both added seven. Reynolds led Sidney with 15 points and eight rebounds. Marcus had nine points, Hallie Truesdale had seven points and five rebounds and Kelsey Kizer grabbed seven rebounds. Piqua was 18-of-65 from the floor for 28 percent and 17-of-21 from the line for 81 percent. Sidney was 14-of-48 from the floor 29 percent and nine of 18 from the line for 50 percent. The Trojans took control by the end of the first quarter and cruised to a home Shelby County Athletic League win on Saturday. Botkins led 13-2 at the end of the first quarter and 24-12 at halftime. Jackson Center outscored the Trojans 11-7 in the third, but the Tigers finished with a 12-9 scoring advantage in the fourth. Carmen Heuker led Botkins with 12 points while Janell Greve scored eight and Makenna Maurer and Tiara Greve each scored seven. Raquel Kessler led Jackson Center with nine points while Ashley Mullenhour added seven. Fairlawn took control with a 15-7 scoring advantage in the second quarter and pulled away with a 15-6 advantage in the third on Saturday. Lauren Dudgeon led Fairlawn with 12 points while Lonna Heath scored 11. Kennedy Spicer added eight points and a team-high seven rebounds and MaCalla Huelskamp added eight points and five rebounds. Houston statistics were not reported. Versailles was in control the entire game in a home nonconference win over neighbor Russia on Saturday. Liz Ording led Versailles with 13 points and Caitlin McEldowney added 10. Jenna Cordonnier led Russia with 16 points. Bradford outscored Lehman 24-4 in the fourth quarter to come away with a nonconference victory on Saturday. Grace Monnin had 12 points, eight steals and three assists for Lehman. Carly Edwards had 10 points and six rebounds, Lauren McFarland had four steals and Hope Anthony added three steals. Riverside took control early and cruised to a home nonconference win over Northeastern on Saturday. Kalin Kreglow scored a game-high 18 points while dana Jones scored 14. Courtnie Smith scored nine points and had 12 rebounds, five assists and five steals. Fort Loramie’s Nick Brandewie dribbles during a nonconference game on Saturday in Maria Stein. Fort Loramie’s Nolan Berning dribbles during a nonconference game on Saturday in Maria Stein. 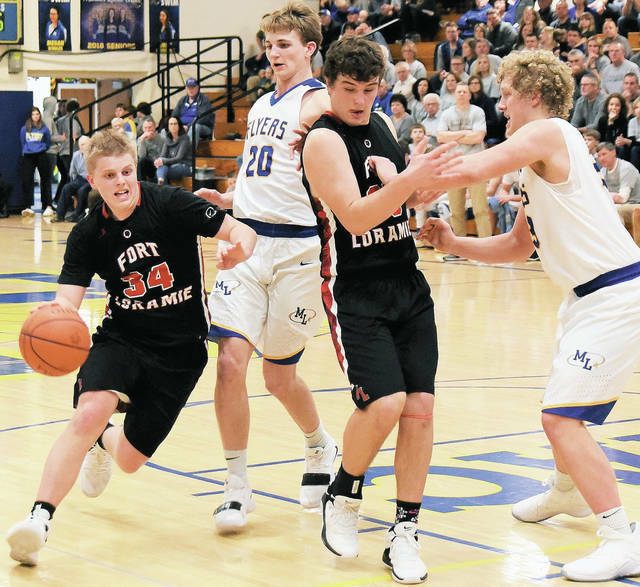 Fort Loramie’s Eli Rosengarten drives to the basket with pressure from Marion Local’s Nathan Bruns during a nonconference game on Saturday in Maria Stein. Botkins’ Tyler Free gets a rebound during a nonconference game on Saturday in New Bremen. 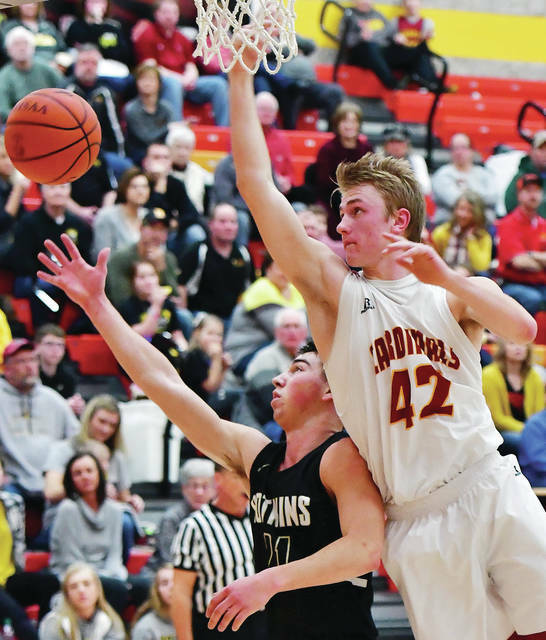 Botkins’ Spencer Heuke and New Bremen’s Benjamin Kuck go after a rebound during a nonconference game on Saturday in New Bremen. 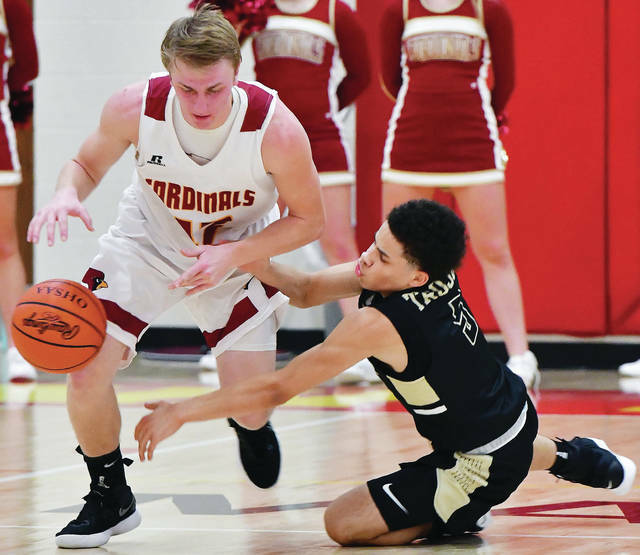 New Bremen’s Benjamin Kuck and Botkins’ Jayden Priddy-Powell go after a loose ball during a nonconference game on Saturday in New Bremen.